A new 42-page booklet on salt marshes in the Gulf of Maine offers a reader-friendly look at the ecology of these vital coastal wetlands and ways to bring them back to health. Salt marshes remove pollution from the water, provide food and shelter for fish and birds, protect the shoreline from erosion and perform other valuable roles in the ecosystem. However, 75 percent of salt marshes in New Brunswick and Nova Scotia and 37 percent in New England states have been destroyed, according to the booklet. Many remaining salt marshes are in poor health because of road crossings, development of surrounding land and other human impacts. The rising sea, due to climate change, looms as a major threat. The booklet presents an overview of scientific findings about ecological functions of salt marshes, their connections with fisheries and the larger Gulf of Maine ecosystem, efforts to restore damaged marshes and the need for regional monitoring of salt marsh health. The booklet—Salt Marshes in the Gulf of Maine: Human Impacts, Habitat Restoration, and Long-term Change Analysis—was published in February 2008 by the Habitat Restoration Subcommittee, Habitat Monitoring Subcommittee, and Science Translation Project of the Gulf of Maine Council on the Marine Environment. It is an element of the Council’s five-year Action Plan to enhance the health of the Gulf of Maine ecosystem. 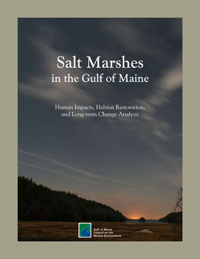 To download the booklet or request a hard copy, go to http://www.gulfofmaine.org/saltmarsh. The Web page also contains links to other publications and online resources related to salt marshes. The Gulf of Maine Biodiversity Discovery Corridor is a swath of ocean and underlying seafloor extending from shore to deep sea that is the focus of regional biodiversity investigations. A compilation of historic research in Discovery Corridor waters, prepared to guide future research, is available online. ... The December 2007/January 2008 issue of MPA News (Vol. 9, No. 6) includes the results of a poll on what should be done when Marine Protected Areas do not meet their goals. ... The Food and Agriculture Organization of the United Nations’ Fisheries and Aquaculture Department has launched a Web site to increase knowledge on the contribution of Marine Protected Areas to fisheries management. ... The first newsletter on “GISFish,” the Global Gateway to Geographic Information Systems, Remote Sensing and Mapping for Aquaculture and Inland Fisheries, is now available online. ... The Canadian Aquaculture R&D Review includes information on recent and completed research projects related to salmon, trout, charr, oysters, mussels and other species.